I took the title of this presentation from a poem by Seamus Heaney, about the consequences of bigotry and prejudice. And of course Heaney’s phrase echoes one in the Book of Exodus “I have been a stranger in a strange land”. That is apposite because the first denunciation of trafficking in Western Christianity came from a migrant and former slave, St Patrick , echoing a more visceral strain of European anti-slavery demonstrated by Spartacus and Crixus in their desperate struggles for freedom. It is also apposite because the contemporary exodus of poor migrants in search of decent work can, too often end with their enslavement rather than their liberation. Because contemporary slavery is another consequence of bigotry and prejudice. A group of Polish construction workers came to a police station in England to complain about not being paid and about their working conditions. They did not speak much English and were swiftly turned away as the police deemed this not to be their matter. Another group of Polish workers who worked for the same construction project complained to another police station and were met with the same response. Eventually, following the complaints from the Polish authorities, the UK police investigated the case and ended up prosecuting the recruiter that trafficked the Polish workers in the UK. The first key lesson, I think, is that in order to properly identify survivors of forced labour and to detect trafficking it is important that those charged with upholding the law actually know what the law is and what their responsibilities under the law are. If the police in this case had bothered to pick up a phone to obtain a translator and to explore the accounts of the workers against the indicators of forced labour they would have found that they were being presented with an enormous opportunity to deal with something that is explicitly recognised as a major crime in British, let alone European and international, law. But in being ignorant of the law they are not alone. This ignorance is widespread even amongst many who should know better. I’ve been at more than one meeting, some of them organised by the Churches, which have had keynote speakers seriously asking “Is trafficking slavery?” and failing to come to any convincing conclusion after half an hour’s deliberation. The struggle against slavery is one of the oldest human rights struggles in the world, so if someone is new to this field, as some important actors are, it is important to remember that we do not have to reinvent the wheel. This path has been trodden by giants before us and we are building on the work that they have done. Indeed without proper consideration of the learning of anti-slavery activists from history and from the world beyond Europe and, indeed, beyond Christendom, there are considerable risks that efforts towards ending trafficking will result in little more than well meaning slogans. it is vital to note that this question of, “What is slavery?” is not a matter for social scientific contention of the sort so beloved by academics. It is something that has been established in international law as a result of considerable effort over the past 100 years to provide a robust framework for the continuing struggle against slavery. Part of the reason for the breadth of law in the international conventions is that contemporary slavery reflects a diversity of human experience: a life lived in bonded labour in Indian brick kilns is different in important respects from that of a Nepalese domestic worker in Lebanon, or somebody in chattel slavery in West Africa, or a “restavek” child slave in Haiti, or a forced labourer in European agriculture. This can complicate identification. It also means that the responses to these diverse manifestations of slavery must be nuanced and adjusted to the realities of those particular abuses in the time and circumstances in which they occur. But in spite of the advances of national, European and international law on forced labour over the past few years there clearly is not yet a general law enforcement culture across Europe and the rest of the world that appreciates adequately the nature of forced labour and trafficking in a way that they would for other crimes of violence. So there there needs to be greater professional police and other criminal justice training to understand their diverse roles and responsibilities towards this crime. And there will remain a need for specialist units to support local efforts and to help lead and develop police and criminal justice policy and practice through example. A second important matter that this case illustrates is that while there are a diversity of manifestations of slavery there are underlying all such cases, three common factors: individual vulnerability, social exclusion, and failure in rule of law. Slavery emerges at the conjunction of these three factors. The issue of social exclusion and discrimination is a fundamental one in slavery: when we look at historical slavery in the Americas we see that racism was both a cause and a consequence of that slavery. This remains the case today. In Latin America today many in forced labour are indigenous people. In South Asia most people in slavery are Dalits or from other scheduled castes or minority groups. And in Europe most people in slavery are migrant workers. This is important for a variety of reasons. Most immediately it hinders the identification of survivors to trafficking and slavery. It is wholly without credibility to presume that any individuals charged with identification of survivors of trafficking are going to be immune from the prejudices of the wider society from which they are drawn and to whose elite they report. It is not fanciful to suggest that the police who encountered these Polish workers may have regarded them with some disdain and some may even have felt that their responsibilities towards foreigners in exploitative employment were lesser than those towards locally born citizens. Indeed this point is emphasised when one considers the broader figures relating to identification of survivors of trafficking in the UK. There, if a person from the European Union presents themselves to the authorities as a potential survivor of trafficking then there is a greater than 80% chance they will be recognised as such. If they come from outside the European Union then there is less than a 20% chance they will be recognised as such. That sort of imbalance in decision making can only be the result of institutionalised discrimination, something fed by the media and political elites who should instead be sanctioning those who disgrace their offices by privileging their petty bigotries over their responsibilities under the law. It is beholden upon leaders across Europe and the world to take active steps to eradicate these sort of prejudices, sanctioning public officials who disgrace their offices by pandering to their bigotries rather than upholding rule of law. But often political leaders themselves privilege their prejudices and exclude the groups they dislike from the basic protection of rule of law. In India, for example, a system of caste-based apartheid excludes Dalits and other minority groups from the effective protection of rule of law. Indeed even Pope John Paul II noted that within the Catholic Church in India discrimination against Dalits was rife and a matter that the Church had failed to respond adequately to. Such acquiescence in discrimination allows almost 300 million Indian citizens to be enslaved by more powerful members of society in a range of industries from brick kilns to garment manufacture. This benefits us too. Probably each one of us in this room is wearing at least one garment tainted by being manufactured using slavery. Now when we present evidence of forced labour in their supply chains to businesses their defence tends to be “But we audit our supply chains!” Such ethical auditing has been going on for years now. Its reasonable to come to some assessment of its effectiveness. And one of the things that is completely clear is that it has been wholly ineffectual in identification and protection of vulnerable workers, and wholly inadequate in bringing about any reform in the systems of production where forced labour and trafficking are so rife. That should not be news to anyone because the purpose of “ethical auditing” is to find nothing. And should some diligent journalist or non-governmental organisation ever expose the sort of exploitation that is routine for the supply of cheap garments to our high streets, there is no consequence for those businesses or the business executives who have made the decisions to source from slavery. Their goods are not excluded from European markets. The executives are not held criminally liable. In Qatar and across the Gulf there has recently been attention paid to the systematic use of forced labour of tens of thousands of migrant South Asia labourers in the preparation of the infrastructure for the 2022 World Cup. This forced labour is underpinned by what is called the “kafalah” system. This is a so-called sponsorship system that ties workers to their employers to such an extent that even in the most abusive employment relationships, up to and including forced labour, the workers cannot change jobs or even go home. It is a cynical system to facilitate medieval levels of exploitation up to and including slavery. It is also essentially the same system that the United Kingdom government has in place for migrant domestic workers, which de facto legalises trafficking for forced domestic servitude. Here again the issue of discrimination comes into play in facilitating slavery. By refusing to recognise the realities and risks to migrant domestic workers lives because of the simple fact that they are migrants the powerful in society refuse to recognise, to identify, their enslavement and hence singularly fail to protect them. Now I don’t know what the Churches are saying privately to the UK government about this, but publicly some church leaders are acting as little more than cheer-leaders for the British Government’s hype that it is becoming a world leader in the struggle against slavery. Frankly the only people who would see what the British government is doing is world leading are those who know nothing about what world leading action dealing with the fundamentals of contemporary slavery actually looks like. When we consider cases such as these it is clear while organised crime is an important element in contemporary slavery it is in a considerable minority. The vast majority of slavery in the world today is disorganised, perpetrated by ordinary people provided with the considerable opportunity for exploitation and indulging of their prejudices and racism by the failures in rule of law across the world. This case of Polish workers in the UK illustrates another important point and that is the value of governments acting on behalf of their migrant citizens. It was the intervention of the Polish government here that compelled the British authorities to action. I would argue that there is a universality to this lesson. The remittances of migrant workers across the world are vital for poverty reduction and human development in their home countries. The contribution that migrant workers are making to the countries of their birth indicts their home governments failures to fulfil their international responsibilities towards their citizens. Aside from the moral and legal responsibilities of governments towards their citizens their failure to do more to protect migrants is short-sighted economically as it could help them obtain decent work and hence higher remittances. Tom Bingham, one of the outstanding British jurists of the past 50 years argued that human rights, including, of course, an absolute prohibition on slavery, must be at the heart of any credible system of rule of law. But, as we have seen, sometimes societies and nations refuse to apply these basic protections to particular social groups. 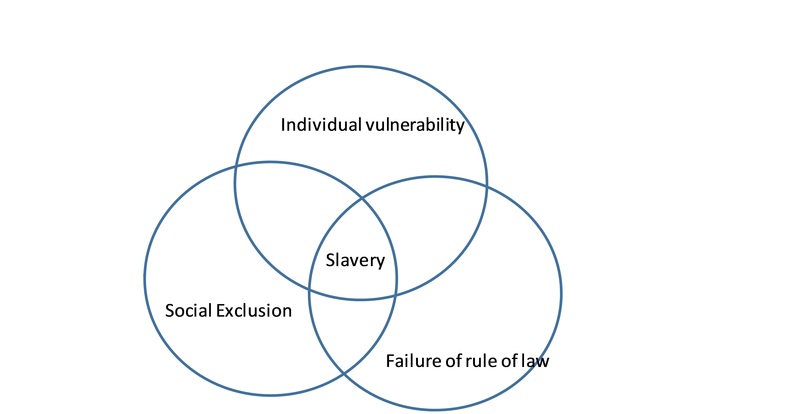 Political leaders are able to get away with this because the prejudice against the enslaved and their communities prevent slavery from becoming a political issue: if slavery is being inflicted upon groups and individuals who the wider society simply does not like, then that wider community is more likely to tolerate the abuses if they see them and not raise their voice to demand that governments do their jobs to stop the problem. This strikes at the very principles which Europe is meant to represent: equality before the law, rule of law and human rights. Slavery is a crime but its effective eradication requires more than a narrow criminal justice approach. It requires a rethinking of aid, trade and diplomacy as well as criminal justice. Within our own common European homeland it requires a repudiation of the causes, in particular anti-migrant bigotry, as well as its consequences. Countries which are establishing their competitive advantage in whole or in part based on their toleration or facilitation of forced labour should not be granted unimpeded access to European markets. Business executives who knowingly use forced labour in their supply chains should be held criminally liable and Europe should advocate for and implement extraterritorial law on this matter. When we discuss the issue of identification and protection of victims of trafficking we normally think of law enforcement being responsible for this. As I have alluded business also has such responsibilities, moving away from the discredited systems of auditing towards more effective ones of investigation. Aid agencies also have responsibilities for identification and protection. The European Commission, Caritas, Christian Aid, Oxfam and others work across the world in countries where slavery is prevalent and were options for decent work for socially discriminated against groups are limited. So slavery eradication should be mainstreamed into all European funded development and humanitarian projects. This can start relatively simply by asking of each project what is it doing to address the issues of slavery and ensure that those who are vulnerable to discrimination and social exclusion are incorporated into the programmes. The answer “nothing” may be reasonable – some projects will legitimately have other priorities. But introducing this question to development and humanitarian response would at least engage the scores of professionals working in these sectors and harness some of their energies and abilities toward the purpose of ending slavery. Europe should assert that the eradication of slavery and child labour should be made stand alone post-2015 sustainable development goals and should act as if it is so in the development of its aid strategy. One critical area with which Europe could make a vital contribution through aid and diplomacy is on strengthening rule of law, in particular anti-slavery law, in states like India, which have decent law but fail to protect its citizens because of inadequacy of labour inspections, corruption in police, insufficient judicial capacity and engrained caste-based apartheid. Given that so many of India’s Christians come from the Dalit and scheduled castes the Christian churches should at least have a selfish interest in ensuring that the rights of our co-religionists, as all human beings deserve, are robustly asserted. Harry Truman once said “Its amazing what can be achieved when you are not bothered who gets the credit!” Indeed that is because, as Bobby Kennedy pointed out it is from numberless diverse acts of courage and belief that the history of our times are written. Slavery is a human institution but like all human institutions it can be changed by human action. So the immediate challenge is: how do we, professionally, as individual citizens and collectively, use our power to fashion a political economy that repudiates slavery in all its forms and all its evolutions. That is a challenge which has no easy answer and which requires a dynamic process in response. But while we don’t know how this struggle will end we do know how it should begin. Jesus said “I bring not peace but the sword”. Europe and Christianity should pick up that sword now, and stand alongside the other Christians, Buddhists, Muslims, Hindus, non-believers who have been labouring for decades in isolation to challenge those vested interests who maintain, for their own selfish ends, the political economic systems that enslave people the world over.